If you want to enhance your WordPress site, there’s no better time than Black Friday. These once a year deals give you a chance to save big on some of the best plugins and tools out there. But a lot of these posts about the best WordPress Black Friday and Cyber Monday deals are just a mish-mash of random sales. And while that approach has value for some people, it’s not especially helpful for regular WordPress users or are just looking to make their sites…better. We’re going to take a different approach. 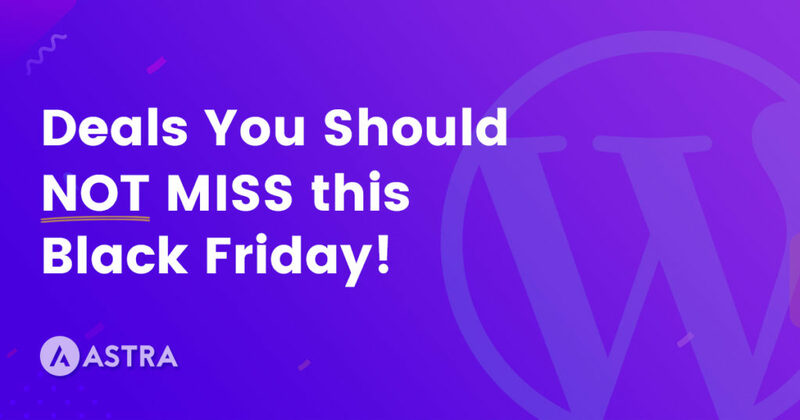 Instead of trying to share every deal in existence, we’ve curated a list of Black Friday deals for just the most essential WordPress plugins and tools. …these are all deals that will make a real difference on your website every single day. And if you grab them during Black Friday, you’re going to save an absolute bundle. Speaking of bundles – we’re also running our own huge Black Friday deals! This Black Friday and Cyber Monday, you can get 30% off our Mini Agency Bundle and Agency Bundle (or you can also snag individual discounts on many of our products). These bundles contain a multitude of helpful tools and give you a great foundation to stack the rest of these Black Friday and Cyber Monday WordPress sales on. Our Astra theme pairs perfectly with most page builders. Additionally, all the premade Astra starter sites are built with either Elementor or Beaver Builder. Elementor had a big year in 2018, expanding with powerful new features like true theme building. Despite adding a lot of value to the product, the price hasn’t changed. And on Black Friday, the deal gets even sweeter with 25% off all Elementor plans. Beaver Builder has been around for a while now and rightfully built a reputation for quality and stability. They’ve also expanded into theme building with their separate Beaver Themer extension. The foundation of your site is its hosting. You need a quality host…but a quality host can be expensive. That changes on Black Friday! For best results, purchase multiple years at a time to lock in Black Friday pricing for as long as possible. Liquid Web is known for their reliable hosting services. They offer an 100% uptime guarantee and this Black Friday they have a great deal in which they are offering 50% OFF on six months of hosting! SiteGround offers basic managed WordPress features like built-in caching and automatic updates for a fraction of the price. Beyond that, you’ll also get stellar performance and great support. InMotion Hosting offers both cheap shared hosting plans as well as affordable managed WordPress hosting plans. This Black Friday and Cyber Monday, you can save on both. Cloudways lets you take advantage of the power of cloud hosting by giving you a user-friendly dashboard (rather than forcing you to be a server admin!). You can choose from cloud hosting providers like Google, DigitalOcean, and Vultr. Then, you’ll manage your site through Cloudways’ interface. Unless your host already runs backups for you, you must have a backup plugin to keep your site’s data safe. UpdraftPlus is always a solid free option, but you can also save on some great premium options this Black Friday. BackupBuddy is a premium backup plugin from iThemes. It gives you an easy-to-use interface that lets you automatically or manually backup your entire site (or just specific parts of your site). You can also store your backups in off-site locations and easily restore your site if needed. BlogVault is a popular service that automatically backs your site up to an off-site location every day. It’s very hands-off – you set it up and then it does everything for you like clockwork. One unique thing about BlogVault is that it also offers a built-in staging site that you can use to safely test changes to your site, which is valuable all by itself. Backups keep your data safe, but security plugins help stop you from ever needing to use your backups in the first place! This Black Friday, you can keep your site safe without feeling like your bank account has been robbed. MalCare is a WordPress malware scanning and security hardening plugin that won’t slow down your site. From the same developer as the BlogVault service, MalCare uses off-site scanning to find malware and, if needed, fix it with a click. iThemes Security is one of the most popular security plugins at WordPress.org, where it has a 4.7-star rating on over 3,800 reviews. Every single WordPress site needs a quality SEO plugin. Here are two great options that you can grab for a discount. By itself, the internal link suggestions feature is super valuable! SEOPress hasn’t been around for as long as Yoast SEO, but it’s quickly growing in popularity and has a 4.9-star rating on over 170 reviews at WordPress.org. Every website needs a basic contact form. But premium form plugins can also go further and help you handle payments, user registration, front-end content submission, and lots more. Gravity Forms is especially popular with developers because it can do…well, pretty much anything. And if the core Gravity Forms plugin can’t do it, you can probably find a third-party extension that can! WPForms is another flexible form plugin that you can use for everything from basic contact forms to payments and more. It doesn’t have quite as vibrant of a third-party add-on marketplace, but it does have one of the best interfaces of any form plugin. While the Astra theme is built to give your site a high-performing foundation, the right caching plugin can speed things up even more. While there are a lot of free caching plugins, WP Rocket stands out because of its simplicity and comprehensiveness. You pretty much just activate it and your site starts loading faster. It also does more than just caching, with plenty of other performance boosts like lazy loading, GZIP compression, minification, and more. Swift Performance Pro is another all-in-one performance solution. It hasn’t been around for as long as WP Rocket, but it’s been getting a ton of quality mentions in WordPress Facebook communities. Finally, to help you successfully use all of these tools, we’ve found some great Black Friday deals on WordPress learning courses. Having a handy tutorial for WordPress is always a good idea. It surely helps when you want to give adequate training for clients. WP Elevation in their Video User Manual plugin has focussed on everything you see within your WordPress dashboard and much deeper with commonly used plugins covered too! This Black Friday season, you can grab this amazing tutorial plugin at 66% OFF that is just around $97 per year! Build Your WordPress Toolkit Without Breaking The Bank! By combining these plugins with all the value that you get with our Mini Agency Bundle or Agency Bundle, you’ll be able to build powerful, successful WordPress sites without breaking the bank. You won’t find better prices on these products until next year, so don’t wait around. Grab your discounted copy of our Agency Bundle or Mini Agency Bundle today and then take advantage of these deals and save big on building your WordPress success toolkit.